Dude, where’s my Stoney Tangawizi? 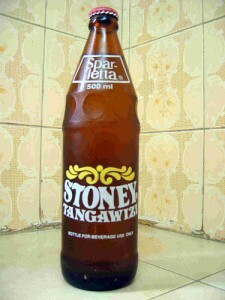 The best drink in the world is a Stoney Tangawizi. It is like ginger ale and 7-up all mashed together in spicy-sweet goodness. This is a Coke product that you can only get it in Africa, as far as I know. I ordered it every opportunity I had, which was pretty much every day; sometimes several times a day. Mmmmm. There is a part of me which thinks it should be available in the comfort of my own home and part of me that thinks it should be kept as a special treat with special memories. I can’t decide. Cheers to whomever took this picture. I found it on Google. Previous PostPrevious Have you met my friend Judith?